A Boeing KC-46A Pegasus tanker takes off from Boeing Field in Seattle on its way to Altus Air Force Base, Okla. The jet was the fifth overall delivered to the US Air Force and the first that will be based at Altus, where the 56th Air Refueling Squadron is responsible for aircrew, maintenance and support training. Boeing today delivered its fifth KC-46A Pegasus tanker to the US Air Force, the first that will be based at Altus Air Force Base, Okla. 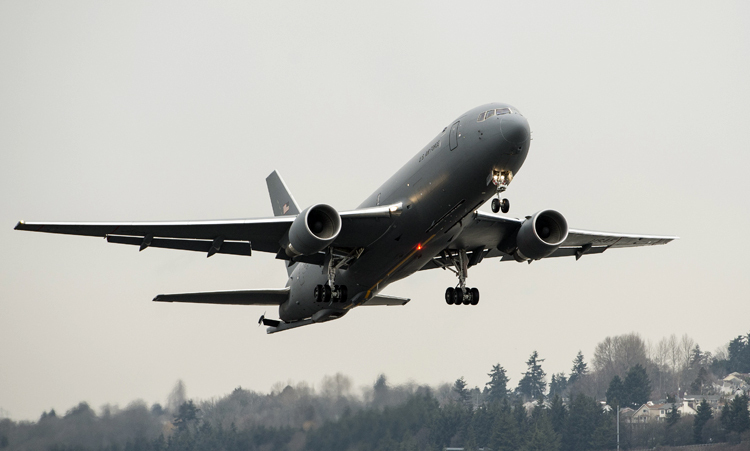 The KC-46 departed Seattle's Boeing Field for Altus, where the base's 56th Air Refueling Squadron is responsible for Pegasus aircrew, maintenance and support training. "We're excited to see the Pegasus arrive in Oklahoma, a strong partner to Boeing and America's military," said Boeing Defense, Space & Security President and CEO Leanne Caret. "We look forward to continuing to deliver KC-46 tankers to Altus, McConnell Air Force Base in Kansas, and New Hampshire's Pease Air National Guard Base, throughout this year." The 56th ARS was activated August 2016 in preparation for the new tanker's arrival. Three additional KC-46A aircraft will be delivered to Altus in the coming weeks. "The 'Mighty 97th' is looking forward to accepting and integrating the KC-46 into our mission," Col. Eric Carney, Commander of the 97th Air Mobility Wing at Altus Air Force Base, said. "The 97th AMW has and will continue to produce combat-capable pilots, loadmasters, and boom operators for the KC-135, C-17, and KC-46 and we remain committed to innovating how we train them to be a part of a joint force to win our nation's wars." The KC-46, derived from Boeing's commercial 767 airframe, is built in the company's Everett, Wash., facility. Boeing received its initial contract in 2011 to design and develop the Air Force's newest tanker aircraft.